Meeting with media is certainly an integral component of the trade show work we do on behalf of clients – and while these face-to-face meetings are key for fostering media relationships and generating coverage, they’re not the only way to make valuable use of time on the show floor. 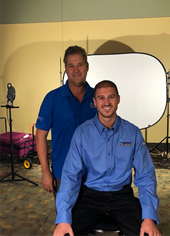 Case in point: At the latest Remodeling Show and DeckExpo, an annual trade show for builders, decking contractors and manufacturers, the LCWA home PR team used the time in between appointments to help produce a series of video testimonials for our client Trex RainEscape. Knowing that DeckExpo tends to attract a smaller pool of media, we planned ahead for the downtime by arranging to have a camera crew on site to capture footage of contractors speaking about their experiences with the RainEscape system and the company’s complementary Trex Protect joist beam and tape. In just one afternoon, we secured interviews with five of the country’s leading deck builders and had enough footage for two separate testimonial videos. By virtue of having everyone in the same place at the same time, producing video testimonials on site is a great way to overcome typical production challenges related to travel and availability – while also being a responsible steward of client time and resources. Check out the finished videos below.